A new music video from the upcoming Descendants 2 has been released online. 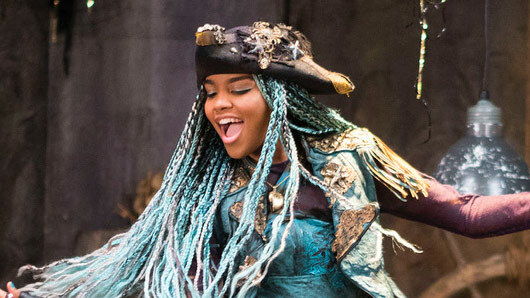 China Anne McClain and Thomas Doherty, who are new to the Descendants film franchise and play the daughter of Ursula and the son of Captain Hook respectively, feature in the new video, titled ‘What’s My Name?’. Their characters, Uma and Harry, will serve as antagonists to the Descendants hero Mal (Dove Cameron), the daughter of Malificent. In the first hit film, Mal and her friends Evie (Sofia Carson), Carlows (Cameron Boyce) and Jay (Booboo Stewart) were invited to attend school in the homeland of Disney heroes, Auradon, after it was decided children ought not to suffer from the mistakes of their parents. However, the second-generation villains were more than willing to use the experience as a way to help out their exiled parents. ‘What’s My Name’ is the second music video release from Descendants 2, after the release of ‘Ways To Be Wicked’ in April. It is one of six original songs to feature on the film’s soundtrack, which will also include reworked versions of The Little Mermaid‘s ‘Kiss the Girl’ and ‘Poor Unfortunate Souls’, starring McClain. Disney’s Descendants 2 is scheduled to premiere on Disney Channel in Autumn 2017. « Love Island spoilers: Could this be the end of Camilla and Jonny?